The Elisa coverlet, with its special texture, completes the look for any Vintage collection ensemble adding an elegant touch to the bed. Made of 100% cotton it is perfect for mid-season temperatures and as bed cover during the summer. The Elisa coverlet is garment dyed and this special process gives uniqueness to every single piece. Combined with unique Italian finishing techniques, the results are a vintage look with an extremely soft touch. These bedspreads have an easy-maintenance attitude: they can be used straight from dryer or only touched up with an iron if desired for a less casual look. The wide color palette allows for infinite combinations. Finished with an elegant applied border in the same fabric and color. The Elisa decorative pillow shams, with their special texture, complete the look for any Vintage collection ensemble adding an elegant touch to the bed. Elisa decorative pillow shams are in 100% cotton and are garment dyed. This special process gives uniqueness to every single piece and combined with unique Italian finishing techniques, results in a vintage look with an extremely soft touch. They have an easy-maintenance attitude: they can be used straight from dryer or only touched up with an iron if desired for a less casual look. The wide color palette allows for infinite combinations.. Available in Standard, Euro and King sizes. zipper closure. Made in Italy. 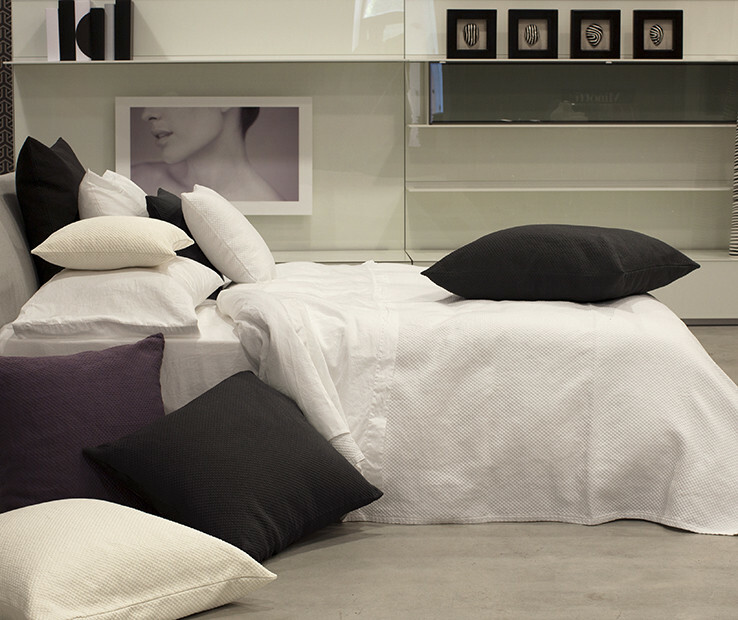 The Elisa duvet cover, with its special texture, is a unique, warm piece of furniture. Made of 100% cotton, it reverses to Viola sateen. The Elisa duvet cover is garment dyed and this special process gives uniqueness to every single piece. Combined with unique Italian finishing techniques, results in a vintage look with an extremely soft touch. It has an easy-maintenance attitude: it can be used straight from dryer or only touched up with an iron if desired for a less casual look. The wide color palette allows for infinite combinations. Olivia is a timeless coverlet that coordinates with our Vintage bed linen collections. The special diamond pattern creates a beautiful three-dimensional effect. Made of 100% cotton it is perfect for mid-season temperatures and as bed cover during the summer. The Olivia coverlet is garment dyed and this special process gives uniqueness to every single piece. Combined with unique Italian finishing techniques, results in a vintage look with an extremely soft touch. These bedspreads have an easy-maintenance attitude: they can be used straight from dryer or only touched up with an iron if desired for a less casual look. The wide color palette allows for infinite combinations. The coverlet is finished with simple hem and has square edges.